First cut a 5 3/4" x 8 1/2" piece of Stamin' Up! Island Indigo card stock and fold it in half for the base and a 4" x 5 1/2" piece of Stampin' Up! Pool party for the front. 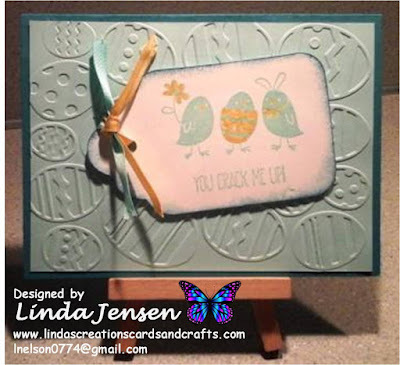 Then emboss the pool party card stock with a Darice Easter Egg Background embossing folder and cut out the tag with a Sizzix Tags, Scallops #2 die. Next sponge the tag's edges with Stampin' Up! 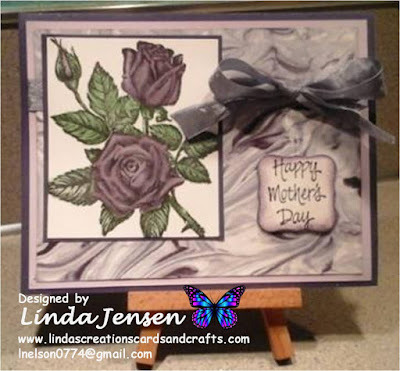 Island Indigo ink, using a Stamp a ma jig stamp the images with Stampin' Up! Pool Party ink, color them with a Stampin' Up! Daffodil Delight ink pad and blender pen and tie the Daffodil Delight and Pool Party ribbon at the top. Then attach the tag to the front with mini pop dots, attach the front to the base and enjoy!